Charcoal Grill barbecue with four compartments. Moveable. 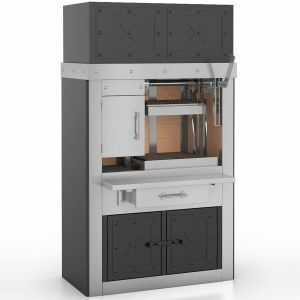 Charcoal Grill for cooking steaks has one compartment, one cooking zone, 1.25m. Charcoal Grill for cooking steaks has one compartment, one cooking zone with height adjustable grates. The cooking zone is on the right, 1.25 m.
Charcoal Grill for cooking steaks has one compartment, one cooking zone with height adjustable grates. The cooking zone is on the left, 1.25m. 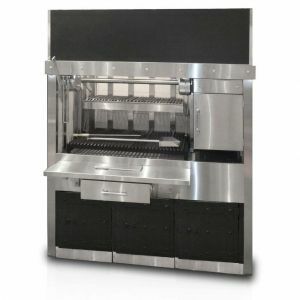 Charcoal Grill for cooking steaks has one compartment, one cooking zone with height adjustable grates. The coal pan is on the left, the cooking zone (1150х820mm) is on the right. The stainless steel worktop is in front of the grates, the drawer for accessories is under the worktop. The grid shelves over the cooking surface hold the grilled products warm. The grill is completed with a hood with spark catcher-filters. The grill, constructed of steel is painted with heat-resistant black color. The back and walls are insulated by heat insulation material and firebrick. The grill's front is decorated with stainless steel elements. Air exhaust output - 3200m3/h. 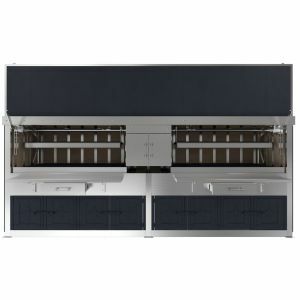 Charcoal Grill for cooking steaks has one compartment, one cooking zone with height adjustable grates. The coal pan is on the right, the cooking grate (1150х820mm) is on the left. 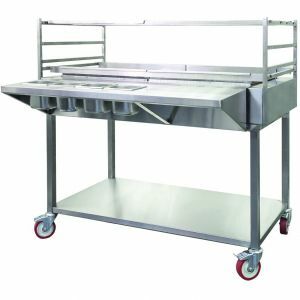 A stainless steel workspace is in front of the grates, there is a drawer for grilling tools and accessories under the workspace. Grid shelves over the cooking surface hold the grilled products warm. The grill is completed with a hood with spark catcher-filters. The grill is made of steel and painted with heat-resistant black color. The back and the walls are insulated by heat insulation material and firebrick. The grill's front is decorated with stainless steel elements. Air exhaust output - 3200m3/h. Charcoal Grill for cooking steaks has one compartment, one cooking zone with height adjustable grates. The coal pan is on the left, the cooking zone (1530х820mm) is on the right. The stainless steel worktop is in front of the grates, the drawer for accessories is under the worktop. The grid shelves over the cooking surface hold the grilled products warm. The grill is completed with a hood with spark catcher-filters. The grill is constructed of steel painted with heat-resistant black color. The back and walls are insulated by heat insulation material and firebrick. The grill's front is decorated with stainless steel elements. Air exhaust output - 3800m3/h. 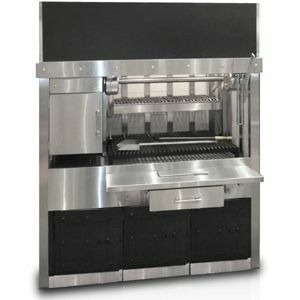 Charcoal Grill for cooking steaks has one compartment, one cooking zone with height adjustable grates. The coal pan is on the right, the cooking zone (1530х820mm) is on the left. The stainless steel workspace is in front of the grates, the drawer for grilling tools and accessories is under the work space. Grid shelves over the cooking surface hold cooked products warm. The grill is completed with a hood with spark catcher-filters. The grill is constructed of steel painted with heat-resistant black color. The back and walls are insulated by heat insulation material and firebrick. The grill's front is decorated with stainless steel elements. Air exhaust output - 3800m3/h. Charcoal Grill for cooking steaks has two compartments, two cooking zones with height adjustable grates. The coal pan is in the middle. The stainless steel worktop is in front of the grates, the drawer for accessories is under the worktop. The grid shelves over the cooking surface holds the grilled products warm. The cooking zone dimensions - 1150х820mm. The grill is completed with a hood with spark catcher-filters. The grill is constructed of steel painted with heat-resistant black color. The back and walls are insulated by heat insulation material and firebrick. The grill's front is decorated with stainless steel elements. Air exhaust output - 6200m3/h.